ClassWarU: Can you tell me about your personal history, how you got into radical organizing, particularly around universities? Ariel: Like a lot of radicals, my first exposure to anything progressive was through identity politics—through women’s studies classes and a white privilege awareness week at my undergraduate university. So, I started organizing around identity issues, and I realized the limitations of doing that probably when I was a Junior or Senior, because there was an anti-abortion group coming to campus that had some racist and sexist hate speech as part of their posters. I wanted to do a campaign to try to get rid of them, and all the liberal students said, ‘no, we have to protect their right to free speech.’ That was really a turning point for me, when I realized there are a lot of limits to doing the identity-based organizing that a lot of undergrads were doing if they did not want to prevent hate speech on campus. I would see student activists graduate and get non-profit jobs organizing. It seemed really limited. So, I started getting into more anti-capitalist organizing through some friends that were in SDS and doing port militarization resistance. I went to the 2008 DNC and RNC protests. I’d never been to a mass convergence before or a protest that was explicitly anti-state or anti-capitalist before, and I found it really compelling. The analyses there were kind of what I’d been looking for. So, I brought back that experience to the university. I was in graduate school by then, just starting. I wasn’t sure how to apply what I’d learned to the university, so I tried to focus on bringing radical politics into the classroom. 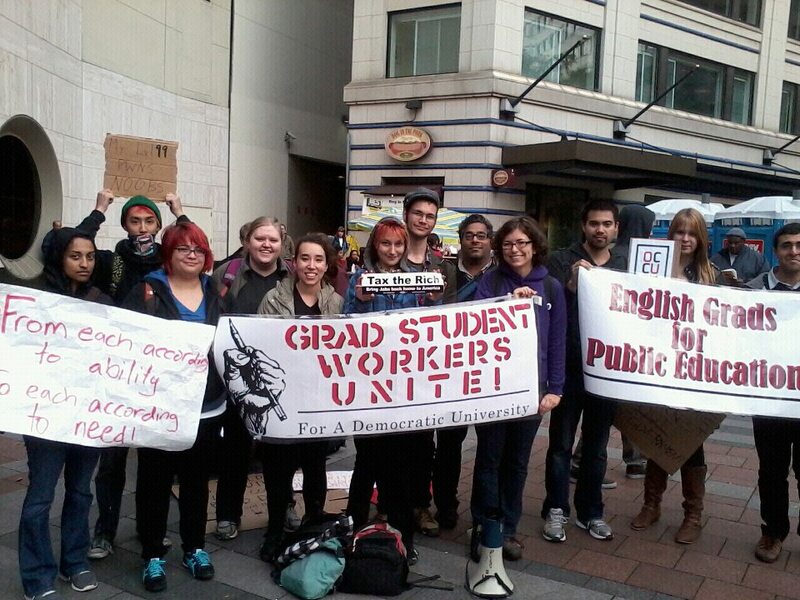 Then, I started organizing at the university when I started my PhD program at the University of Washington in 2009. There was a great group doing anti-budget cuts organizing called Democracy Insurgent. I met up with them. They were doing a campaign to support custodians who were losing a swing shift and getting laid off. I joined their group, and that was finally when I started having experienced organizers help me develop practical skills. I’d never given a speech before, never led chants, never done one-on-one organizing. They taught me how to do all of those things that I was able to apply to organizing, and I helped found For A Democratic University (FADU) which is still around today and I’m still a member today. CW: Could you say a little more about what Democracy Insurgent and FADU stand for and how you are organizing with them? Ariel: Democracy Insurgent isn’t around anymore. It started, before I came around, as a Palestinian Solidarity group, and they were doing an anti-militarization campaign at UW the year before I started there. They decided to shift towards budget cuts to apply some of their analyses of the ways that the university maintains oppression and capitalism and the state, and to link it to budget cuts, because that seemed to be a way that everything we were against was really manifested in the university. There were a lot of graduate students that came around the custodian campaign that wanted to organize. One of the organizers in Democracy Insurgent said, ‘let’s start a reading group,’ and she actually organized us graduate students. We decided that we wanted to form an interdisciplinary labor organization, FADU, as a fighting organization to target the way budget cuts affected graduate students and the undergrads that we taught in our sections. CW: How does FADU try to build organizing relationships between different groups of workers and students, or students-as-workers? Ariel: We believe in practicing the one-on-one organizing model that we borrowed from the IWW. So, we’ll do one-on-ones with people in our departments and try to agitate them around a particular winnable demand. But, in practice, we usually get swept up in whatever organizing is happening on campus. So, our first year of existence, 2009-2010, we were in a student-worker coalition that was across campus, a coalition against budget cuts. We spent most of the school year organizing against a lot of the austerity measures and promoting the March 4th student strikes that were going on around the country. Then, we spent the spring quarter fighting with our union, trying to get them to go on strike—and that was a big learning experience. The second year of existence, 2010-2011, we tried to get a childcare campaign going, but we found that student-parents were often too busy to organize. We couldn’t find any parents who had time to join our group, and that kind of fell by the wayside, when there was another contract negotiation with our union. A lot of rank-and-file members were upset with how our union was accepting a lot of take-aways, and the rank-and-file looked to us to organize. So, we spent spring quarter of 2011 trying to push our union to have open bargaining, and that ultimately failed, but it revealed the union leadership’s distrust of democracy and a mobilized membership. Then, this past year, 2011-2012, we got swept up in Occupy and the manifestations of Occupy that happened on our campus. But, we want to get back to doing the one-on-one departmental organizing again this year. CW: It sounds like you’ve been involved in a lot of different campaigns. Do you feel like you’ve had successes through any of those campaigns? Or, if you’ve had failures, have you learned lessons? Ariel: We’ve had a lot of successes and failures. The failures were definitely learning experiences. We learned, basically, how business unions work. UAW has an interest in keeping smooth the relations between the workers and the administrators on campus, and that’s their job. And they’re not interested in practicing the progressive, democratic ideals that they promote in their official rhetoric. In terms of successes, I think that we helped contribute to a more politicized campus. Like, budget cuts were things that people were no longer accepting as just something that had to happen. Rather, students were more willing to stand up and fight back against budget cuts. So, I think that it changed the way people talked about budget cuts on campus. There were some concessions made by the administration that they will never admit were a result of student organizing. In 2010, the administrators agreed to donate 5% of their salaries to scholarships, and I think that is a direct result of the student worker coalition organizing that year. CW: Stepping closer to your own work experiences, I’d like to ask you about your teaching. Could you say a little about how you, as an anarchist, anti-capitalist, approach teaching in the university? Ariel: So, as an English graduate student, I teach the 100-level composition classes, and there’s a lot of politics behind why graduate students teach that class. Professors don’t want to teach a class they think of as somewhat remedial, even though it’s not actually remedial in practice. We’re pretty unsupervised in the composition classes. We need to teach the students how to write a college essay and how to think critically, but how we do that is largely up to us. So, when I first started teaching in 2007, I didn’t know what the heck I was doing, but I knew I wanted to talk about social justice in the classroom. After a lot of trial and error, I started having success with a decentralized classroom, where we sat in a circle, students led discussion, and students were accountable to each other. I also brought in readings that informed me as a teacher, and shared them with the students. I found bell hooks, Teaching to Transgress, and of course Paolo Freire to be pretty useful for students, to give them language to understand what we were trying to do in this decentralized classroom. Of course it was not a utopian classroom, because we still had to work within the confines of the university. At the end of the class, I had to give the students grades based on the writing criteria that we were assigned. We were given instructions for what an A paper, what a B paper, what a C paper looked like, and we had to justify to our supervisor if we gave out too many As. So, sometimes I did not want to fight that battle of grade inflation, because, ideally I’d like to give every student an A, but that was not realistic in terms of keeping my job and good standing in my department. Then, when I started teaching at UW, in 2010, I taught a composition class that was basically about the budget cuts while the anti-budget cuts struggle was going on. I encouraged students to go to actions. That worked out well, but I found that, at UW, I’ve been asserting my authority more as a teacher, which as an anarchist makes me feel like a hypocrite—demanding respect from students. I had problems with a few entitled students seeing a young woman as their teacher and trying to walk all over me. I don’t have as much of a decentralized classroom, and I don’t know if that’s because I’m being more pragmatic, but I’ve shifted more to having radical content rather than radical form, in terms of my teaching. Anti-Capitalist Service Learning: Social Service or Social Change? CW: How do you think that shift has worked out for you in the class, in terms of the effects for the kind of learning environment you create? Do you feel like it’s been more or less effective getting student to think more critically and getting them into radical politics? Ariel: I think that I’m getting more realistic about what I can accomplish in one quarter, so I’ve decided I just want to put these ideas in students heads that things are not okay, and there’s other ways of living and having social arrangements. So, this school year I taught a service learning class where students volunteered at community non-profits and came back into the classroom and wrote about that experience. That gave me the opportunity to facilitate a lot of conversations about class and poverty and the role of the non-profit in maintaining poverty. I don’t think I convinced any students to becoming anti-capitalists, but at the end of the quarter pretty much all of the students had come to see that capitalism depends on poverty and that needs to change if we want to end poverty. So then the hope is, for me, that when students go on to take future classes about economics or about social issues, they’ll remember what they learned in my class and perhaps be pushed further left. CW: Could you say a little more about how the students interacted with those non-profits? Ariel: There’s an office at UW called the Carlson Center that pairs students with non-profits that ask for UW student volunteers. They’re mostly entry-level positions because we have a lot of students that have never volunteered before, and a lot of international students that are getting adjusted to living in a new country and then have to volunteer. So, the service learning positions are designed to be pretty easy. It’s a great class to teach because the students want to be there, unlike in other composition classes. Students take this section because they have positive experiences with volunteering and they like helping people. Of course there’s a lot of problems with that mentality of providing charity and ideas of the liberal savior coming in to help poor people, but students at least are coming from a place where they think poverty is a problem and we need to do something about it—which is not the majority opinion on the larger university campus at UW. So, that’s something I’ve appreciated from the students taking my class is that their premise is a little more left than the general student body, so they’re at least willing to engage with criticisms of the idea of charity when I bring up those limitations in class. And a lot of them keep volunteering at their non-profit organization after the class is over. CW: Do you think that those students who keep on volunteering bring a kind of critical mindset with them? Ariel: I have them read an essay from The Revolution Will Not Be Funded by Paul Kivel called “Social Service or Social Change,” and I find his essays pretty accessible to non-radicals. And I have an assignment asking them to take some terms from that essay and say, ‘is your organization a social service or a social change organization?’ And they have trouble arguing anything but that their organization is a social service and it’s limited for X, Y, and Z reasons, and they’ll write this in their papers. So, I don’t mind that they decided to keep working in their organization at the end of the quarter. I’m happy that they do. And, I like to think that, after doing assignments where they apply critiques of the non-profit to their own organization that they’ll continue to have that critique as they continue to serve there. CW: You started talking a little about organizing with UAW, and then sort of organizing in a way that tried to change UAW, being critical of them. I wonder if you could expand on those critiques of them. Ariel: Sure. I have a really interesting history with UAW. In 2009, when I moved to Seattle, in the summer before I was starting my PhD program, I emailed UAW 4121 and said something like, ‘hey, I’m moving to Seattle, I’m really excited to be in a union.’ (I’m from a union family. I only had positive experiences with unions. My parents took me to a picket when I was in preschool. And I never knew a union could be a bad thing.) And they emailed me back, and said, ‘let’s have lunch.’ So, I met up with the president of the union, and in that first meeting, he offered me a job. I was kind of shocked because normally you have to apply for a job and interview for a job, but he said, ‘we have a summer organizer position, do you want it?’ And I said, ‘sure!’ I didn’t have a summer job, it sounded fun, and I had a bit of activism experience. So, I worked for them in the summer of 2009. It was a lot of going around and trying to get people to sign up for the union: a lot of cold calling people and asking them to participate. A lot of it was tracking members down and getting them to fill out their membership card so we could collect their dues. I don’t think that I quite clicked with them. It was hard for me to have to read a script when talking to people, and to pretend to be a democrat. They sort of laid me off in October. They just said they didn’t have enough hours for me but would have me come back and work for them when they had hours. I don’t think they knew I was doing other organizing. This was when I was getting involved with Democracy Insurgent, who had a lot of critiques of unions that I’d never heard before. And it was when I started to read things like Detroit I Do Mind Dying, talking about how UAW, specifically, had been anti-worker in many cases, and I started to think, ‘well my union is not like that, but I see how unions can be.’ Then, as time went on, and my union got more of a sense of my politics, as I tended to be out-spoken at membership meetings, I got a bit more ostracized. Now, three years later, I’m a shop steward still, but I have to hear about union happenings through the grapevine. People in my department come up to me and say, ‘hey, the union called me to say they’re having an action tomorrow. Do you know about it?’ And I’m hearing about the action from the people I’m supposed to be telling about it. It was interesting, initially, trying to negotiate both positions of being a militant on-campus and trying to maintain a good relationship with my union. So, I was always trying to be the peacemaker, and I was the moderate one in Democracy Insurgent, saying ‘unions get a lot of stuff done. It’s good we have a union’ because I taught at a school where the grad students weren’t unionized, and I made $9,000 a year teaching a university class, and I was making almost twice that at UW. But, as time went on and I started to see how our contract negotiations went, I became more critical, especially when I learned the difference between business unions and solidarity unions. I realized that I definitely believe in unions, but what I believe in is a solidarity union and not a business union. CW: Does FADU still try to engage with the UAW? Are you trying to reform the UAW, or are you like, ‘forget the UAW, we’re organizing outside of them’? Ariel: There’s always been a friendly disagreement in FADU about what our relationship with the union is. Some members have very good arguments for ‘forget the union, let’s organize outside of them.’ And I think this school year we finally did. But, the first two years of our existence we would say, ‘forget the union, let’s ignore them,’ but then we would get so upset and frustrated with what they were doing then we would go to the membership meetings and push for democracy because no one else was. We felt that somebody had to step up and try to make the union leaders follow their own rules of democracy, and somebody had to push for transparency, because the rank and file in our union is very demobilized and deactivated and we wanted to change that. CW: But now it sounds like you’ve decided to stop trying to engage with them? Ariel: I don’t know if it was so much of a decision as that contract negotiations came up so quickly this year that they were over before we even really knew they were happening. And this is the first year in three years that we haven’t had a one-year contract. The union just negotiated a three-year contract, and it’s the first contract in three years with a wage increase. We had just been busy with Occupy, and we realized, ‘oh the contract just came and went.’ I don’t think it was really intentional, but I think it came out of a place of subconscious frustration that we weren’t paying attention, because we were so fed up with trying to push for democracy for two years and not seeing very concrete results. CW: So, what is FADU’s focus now? Are you focusing on a student-worker coalition? Do you focus on organizing outside of campus also with community-based organizing? Ariel: I feel like this year we were all kind of working on our own projects and then coming back together to talk about them and get feedback and support. Some of those projects were on campus and some were off campus. Next year, I’m hoping that we’ll get back to our goal of having workplace committees and doing department-based campaigns around small winnable demands in our departments. I can’t speak for everyone; that’s just what I hope will happen next year. We’ve also had a lot of members leave due. Some have dropped out of school due to frustration with UW. Some have graduated. So, a lot of energy goes into just maintaining our numbers and maintaining our body of supporters, because we’re in an environment of such a high turnover and such a short institutional memory. CW: That makes me think of two things. Thinking about department-based organizing, I’ve heard that in the Quebec student uprisings that are going on now, they’re organizing with a department-by-department focus. That sounds pretty powerful. Is your approach like that, trying to get together different kinds of workers and students in a department to organize? Ariel: Yes, and we did some of that last year. We organized people who worked in one building, X Hall, and we’d have weekly or bi-weekly meetings with them. But, the action they wanted to take was going to the union meetings and pushing for open bargaining. But then, our open bargaining resolution did not pass. After that, some of the people in the X Hall Coalition were demoralized, and summer came, and it’s hard to get people back together after summer when you’re in the university. But, our name is For a Democratic University for a reason. Our vision is horizontalism in the university, and the people who are most affected by a decision making that decision. I think that department-based committees are one way to manifest a democratic university. CW: Are there any ways you’ve tried to face the challenges of overcoming the usual kind of vanguardism of academics, to try to get service workers, maintenance workers, undergrad students involved in the organizing in a way that allows them to take on leadership? Ariel: I think that the student-worker coalition was able to accomplish leadership from maintenance and custodian workers on campus. There was not a big undergraduate presence, because I think that undergraduate organizers at the time were getting sucked up into the Student Labor Action Project (SLAP), which organized on the behalf of others. It was kind of funny, they actually did a campaign for graduate students, and FADU had many acquaintances in SLAP and were surprised one day when we saw them one day out on the quad with a bunch of signs saying ‘support graduate students.’ And we were like, ‘why didn’t you tell us you were doing a campaign for us?’ It kind of made us, as graduate students, feel in a position that, perhaps, the workers had felt previously, when SLAP had done campaigns on their behalf without any consultation. SLAP apparently had the blessing of UAW, the “official” voice of graduate students. Fortunately, the student-worker coalition had several active custodians and trade workers play key roles, and these folks still organize on campus now. They’ve been working on a campaign to get a co-worker re-instated that was fired for organizing on the job. CW: Could you say a little more about that campaign? Ariel: One worker at UW filed a discrimination suit against the administration. He was killed by a drunk driver before the dispute was resolved. Another co-worker wanted a plaque put up in the man’s honor, and the university fired this guy for trying to get the plaque put up. Basically, the university didn’t want to recognize him because he had accused them of discrimination. The other guy who was fighting for the plaque got fired. There was a campaign going on to get him re-instated. The custodians and tradesworkers are in a union, and there’s always been a kind of turfwar between the activists and the union that they’re in. I think that the union has taken up this issue now, and they’re going through the grievance procedure to try to get him reinstated. CW: You said that the challenge you face is that there’s high turnover of organizers. I feel that this is a widespread challenge for campus-based organizing. Have you tried or thought of any ways of creating spaces or institutions that have more grounded connections in communities that have a more long-term commitment to the campus and the surrounding neighborhoods? Ariel: The geography of UW makes it difficult to build lasting relationships with the immediate communities in the university district, because many of the people who live there are students and, therefore, have a high turnover. But, I think there still are connections that could be made, because there are folks that live in the university district who are homeless. They’ve lived there for decades, and those are relationships that we haven’t made but could make. CW: Have you made any connections with any kinds of organizing spaces, such as radical community centers or social centers? Ariel: Not formally. Some of us are involved in different projects outside the university, but they’re located pretty far from the university, because UW is kind of off by itself. In another neighborhood, there is an anarchist social space called The Wildcat that some of us hang out at sometimes and go to events there, but there’s no formalized connection. It’s the same thing with Occupy Seattle: a lot of us have a presence there but there’s no formalized relationship. I think it might be a matter of capacity, because right now we just have seven core members in FADU, and we’re all preparing for exams or working on our dissertations. So, sometimes it’s a struggle just to have time to make our weekly meeting and then show up to our monthly happy hour that we have to network with other graduate students. Sometimes that’s all we have time to manage. CW: Could you say a little more about Occupy Seattle? Have you seen that as a separate sort of organizing project from what you’ve been involved in on-campus or have there been any connections between Occupy and the campus organizing? Ariel: Occupy Seattle was really exciting, and I’m still excited about it. It was interesting because it just sort of appeared, and when I went on the first day, I thought, ‘I don’t know any of these people. This is great. There are people I don’t know who are doing organizing. It’s breaking beyond the usual scene of 100 or 200 people that always come to leftist events in Seattle.’ Sort of the same thing happened at UW. There was a lot of spontaneous organizing, and there were a whole bunch of groups that called themselves Occupy UW that sprang up, and I didn’t know any of the folks. But, it seemed kind of fragmented. A lot of the people in Occupy UW had never been to Occupy Seattle, and vice-versa. About three months into Occupy, there were general assemblies at UW, and some people at Occupy Seattle started coming to these, because I did some outreach at Occupy Seattle trying to get folks to come. Unfortunately, these general assemblies were not a very positive experience. They ended up getting smaller and smaller every week, and they ended up getting dominated by loud white men that liked to interrupt, and we could never agree on any ground rules for how we wanted to proceed. 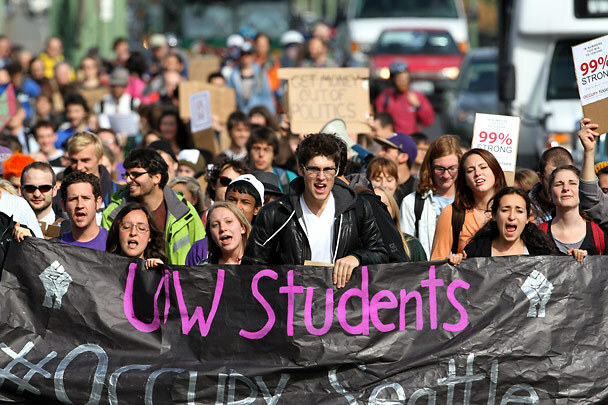 Whereas the first Occupy UW general assembly had maybe 200 students, within six weeks only five students were coming. So, it was not a very positive experience. 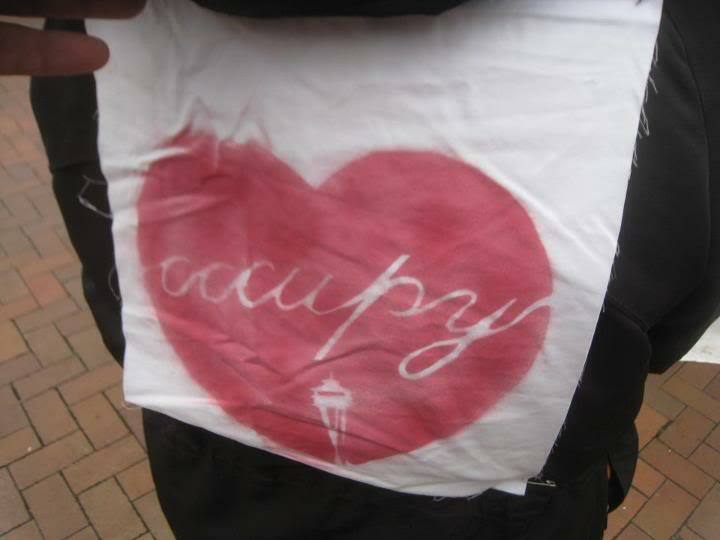 CW: What particular aspects of Occupy Seattle make you excited? Ariel: I’m personally excited about some of the Decolonize organizing. There’s Food For Everyone now that meets on Sundays in the Central District neighborhood which is a historically people of color neighborhood, although it’s been gentrified. There’s a lot of militancy still going on, but it’s really fragmented. No one really goes to general assembly anymore. The liberals and progressives formed a Mic Check Wall Street group as a splinter maybe five months ago, and they don’t ever come communicate with the anti-capitalist folks anymore. Nonetheless, I think there’s a lot of autonomous projects that are really cool, like Food For Everyone, Guerilla Gardening, the folks who organized for the May Day Anti-capitalist March and all-day free hip-hop show. Stuff like that that I couldn’t imagine happening a year ago is still going on and there’s still a high level of energy and attendance. CW: The person who I interviewed earlier today expressed some similar sentiments about what he’s excited about in Occupy: the projects that build relationships with people in marginalized communities where there have already been kinds of informal networks of cooperation. I think it’s a challenge to learn how to recognize those networks and to connect with them. I wonder if you have any thoughts on that. 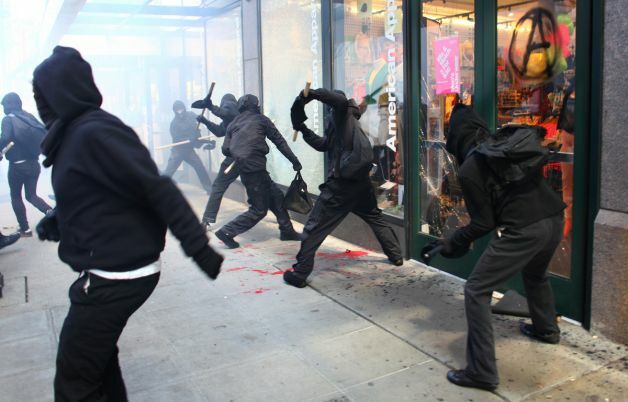 That’s fresh in my mind: how Occupy has highlighted here in Seattle the critiques of the non-profits and how they demobilize social movements, which was illustrated during May Day. CW: Do you feel that those debates have been constructive for organizing? Ariel: I think they have. It kind of helps us know what we’re up against. That’s kind of where all the people are that I went to college with—in the non-profits—and I don’t see them at Occupy Seattle and they’ll write critiques of Occupy Seattle on their facebooks. I think it’s useful for me to think, what’s it going to take to get those folks back involved, since they have an investment in the non-profit industry and, they don’t realize it or don’t want to admit it, but they have an investment in de-mobilizing social movements, because they’re the paid activists and that’s kind of their turf and what they do, and it’s a threat to them when activism is not something that’s paid and something that happens more organically. CW: Do you have any ideas on how to connect with them in a way that could convince them to abandon their capture within the non-profit industrial complex? Ariel: Maybe through the traditional academic ways of debating topics, writing articles, and having academic debates, because that’s kind of the way we learn how to think and communicate in our college educations, and I think people think in that mindset and are convinced in that mindset. The same thing with academics: I’ve found that one of the most useful ways to organize graduate students, at least in the humanities and social sciences is through writing, through research and statistics. They seem to appreciate the analysis FADU has provided when we have written articles and zines, because that seems to be the privileged way of communicating amongst college educated people. They also like reading groups; we read an article about past grad student organizing, then plan an action. CW: I see FADU and other groups as producing intellectual content outside of academic structures. Have you experienced any tensions between members of the groups who are within academia and who are part of, something similar to what you would call the non-profit industrial complex but the academic-industrial complex, where they can use their activist cred as social capital within academia? Ariel: There is, definitely. In the English department, almost everyone is progressive or Marxist and there’s probably ten anarchists out of 200 people in my department, or people who consider themselves anti-state and anti-capitalists, which is great. But, there’s also some turfwars. People sometimes act like they own an idea and get kind of sucked into planning, like, the academic conference—talking about activism and yet you won’t see those same people organizing, because they consider their organizing to be doing academic work on that topic, but don’t seem to think that you need to be organizing to apply what it is you’re researching. I’ve had some conflicts in my department with folks who have an investment in academic work on activist topics, over whether or not that is organizing. CW: Do you have any thoughts on how to combat that kind of co-optation or recuperation of movement ideas and energies into their kind of academic careerist projects—and perhaps in a constructive way to funnel them into real organizing? Ariel: It is too tempting for five or six of us that do organizing in our department to talk about other folks behind their backs and say, ‘oh, isn’t that disappointing that so-and-so is researching social movements but they won’t come out to an action.’ But this isn’t productive. Maybe it’s a matter of not focusing on people who identify as radical, but just trying to organize people who want to fight who have a sense of justice but maybe don’t particularly associate with a radical identity. I think it is important to be tactful and diplomatic, and not write people off for having the wrong political identity. CW: Maybe that relates back with what I was saying about informal networks of cooperation that already exist. You can see that in the university too, thinking about what students do to cooperate in the classroom or what custodial workers do on campus, to maintain effective cooperative relationships with each other under conditions of exploitation. Ariel: I think we have more intellectual work to do in terms of articulating what the academic-industrial complex is and how it functions. I think we need to write a book like The Revolution Will Not Be Funded for the academic-industrial complex, because the academic-industrial complex is the other path that radicals go down. If they don’t work in non-profits, they become academics, and I think that’s just as problematic of a career path. I would like to participate in scholarship that identifies why that’s problematic, because I think we’re kind of in the early stages of articulating our critique of the academic-industrial complex. CW: These interviews are hopefully some steps towards that. It’s tricky. I feel there are a lot of obstacles to getting academics to think self-critically about their own complicity with capitalism. That’s kind of the reason I use the phrase ‘class war university’ to describe this project: trying to get us—even those who consider ourselves radical anti-capitalists—to think about how we’re participating in capitalism, necessarily, through being part of the university that both has exploitative work as well reproducing capitalist relations, creating students, categorizing them, disciplining them. I hope it’s a useful project for you and others in FADU too. Ariel: Well, I think that everyone in FADU will be interested in this project. CW: One other question, kind of tangential… So, I asked if FADU has tried to do any organizing off-campus, like around issues that traverse the campus boundaries. I wonder also if you’ve done any organizing that crosses boundaries between different levels of education, such as organizing with high school students or around education segregation. Ariel: Not formally, but a couple members of Democracy Insurgent were teachers and they would bring some of their students to the protests at UW. One person in particular, a teacher, worked at a school that was kind of students’ last chance before juvenile hall. This teacher would bring his students to protests, and that was really powerful because they would give speeches about access and affordability of higher education and how they were being tracked toward prison instead of university. That sticks out in my mind as a great way to bring together students and workers and high school students who are some of the most marginalized. Nothing like that’s happened recently at UW. But, there’s been a bunch of high school students coming around some of the anti-capitalist and anti-police actions in Seattle lately. CW: The person who I was interviewing before you had an argument that student and university movements now need to connect with opposition to prisons. Also, connecting with everybody who is excluded from college, seeing prison as the most extreme negative end of that, the school to prison pipeline. By thinking about those connections, I think that could give a kind of alternative, more radical vision of the kind of university that we want. Rather than promoting a kind of public university, falling back on this welfare state kind of public education, which preserves an elitist view of higher education. Instead of that, arguing for a kind of totally open university that’s open to everyone and free. Thereby, combating the exclusionary mechanisms that push out students along racist, classist lines. Ariel: Yeah, that’s really important. One of my co-workers, another anarchist English grad student, taught the same class as me this year, and he was able to have a student volunteer at juvenile hall, and he had his students read The New Jim Crow. I think that was an interesting way to try to bring together the university and prisons. But, a lot of work needs to be done, because he kind of had to create these volunteer positions for students, because the office that coordinates volunteering didn’t have anywhere that freshmen could volunteer that had to do with the criminal justice system. He was willing to create that infrastructure. There was a lot of student resistance, but some students really got it, which was great. He’d be a good person to talk to more, if you want to think about the prison aspect. He’s really active in Occupy Seattle and writing his dissertation on it. CW: It sounds like he had to do a lot of extra work above and beyond what he was paid for in order to make his class more radical. Ariel: He did, from my perspective. We both, when we got this job, wanted to teach our classes on the prison-industrial complex. The Carlson Center, the organization that pairs us with organizations, said ‘you can’t do that.’ He was willing to fight for it, and I thought I don’t have energy to do anything I’m not paid for, so I’m just going to teach a class on poverty. I’m glad that he fought to make this class happen. CW: It seems that’s a big limiting condition we face, as precarious contingent low-paid overworked grad students, that it’s hard to make the time to do it. I wonder if we had more of a support network, if we could share resources for how to do that kind of stuff. Ariel: Yeah, that would be awesome. CW: I guess also having a union that actually fought for having radical resources. Ariel: Yeah, that’s something else I’d like to see: a solidarity union at UW, and maybe that will come out of FADU. CW: When you say a solidarity union, do you also mean an industrial union in the sense of organizing across the industry, across trades? Ariel: I think a solidarity union at the university would be cross-sector, but maybe not across society. Eventually maybe the goal is ‘one big union.’ But, I think that it would be nice if all of the campus workers, regardless of whether we’re ‘academic’ or ‘manual’ workers, were in one union that was a horizontally run union. But, I think it will take a while before we get there. I think that having workplace based organizing would be a first step. CW: How do you consider that possibility in contrast with your bad experiences with UAW organizing? Ariel: Well, UAW’s organizing model is really stifling, and that’s part of why I didn’t click with them when I worked for them. You’re supposed to read a script, and you can’t deviate from it, and it’s not really anything that any real person would relate to, the way the scripts are written. A lot of the things they do seem incompetent from my outsider perspective. I mean, just the fact that they just hired me with no process of opening up the position to the members. Maybe other members wanted a summer job. That’s just an example of something that was, I’m not sure if it was deliberately un-transparent or just incompetent, but they needed someone to start working the next day and I happened to call them on the right day, but it was fucked up. CW: Based on my experiences with their hiring process, I imagine that one reason they chose to hire you was because you were new and you did not already have relationships built with the radical organizing on campus already. Ariel: I’ve heard that from folks organizing against them in California too. That’s their process. They try to swoop up new people so that they can indoctrinate them into the UAW model. I guess they decided that I was non-indoctrinateable. Ariel is a grad student-worker at the University of Washington-Seattle. This interview was conducted on June 8th, 2012.